Welcome to the jungle. This isn’t any old jungle though mind you, this is a concrete version: a shady town known as Metrocity in which all manner of thrills, spills and shenanigans unfold. Metrocity is the location in which Highroller’s casino games occur and online casino players are wowed with innovation. It’s constantly visible in the background of the website, yet it also has a more formal use to players: as you make your way through its ‘districts’, you’ll earn points which can be substituted for cash boosts, free spins and plenty more besides. The good news is that generosity extends to live casino games too. That whole Metrocity thing is a nice gimmick from Highroller, and it’s good to see it rewarding its players for their loyalty in a unique way. But don’t be fooled into thinking this is a live casino site that favours style over substance – there’s plenty for casual gamers and serious punters alike to admire about this brand. To ensure its players are able to immerse themselves in the best environment possible, Highroller has teamed up with Evolution Gaming; the masters of live casino action. Evolution provides the platform and the eleven live casino games that Highroller currently offers, and with the brand continuing to dominate the space you can rest assured that plenty more new releases will be added in due course. 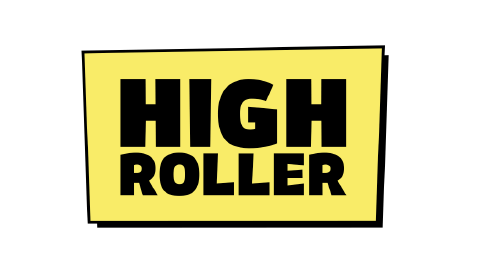 Mobile gamers are well supported by Highroller. Its browser site features a staggering 500 games – almost unheard of from a mobile casino, and is optimised to work seamlessly on Android and Apple devices. At the time of writing there’s no dedicated app available (note: there is another ‘Highroller Casino’ on the various App Stores, but this is not affiliated to the brand we’re reviewing here). The mobile version of Highroller features eight unique live casino games for players to enjoy. There are six distinctive variants of roulette: traditional, American, Immersive, Speed, Auto-Roulette and Auto-Roulette VIP, plus live game other variants including Casino Hold ‘em and three-card poker. You can choose between a number of different tables at times, and even select which dealer you’d prefer to interact with during your game. The Highroller mobile site is a fantastic environment in which to enjoy your favourite casino games, and the live casino in particular is a space in which most will be happy for hours on end. Rarely is it such a pleasure to actually use a live casino site, but clearly Highroller has been conceptualised and developed by a team that knows what gamers want. Navigating between menus and pages is a cinch, and once you’ve located the live casino page the rest takes care of itself. Simply choose your game, wait for the stream to load (this occurs reassuringly quickly) and away you go. Each game comes to live in a ‘lightbox’-style screen, making the action really stand out. If you’re not on the edge of the seat when playing at Highroller we’d be rather surprised. At the time of writing there are twelve live casino games available to players on the desktop site, and eight for mobile users to enjoy. This is not the most exhaustive list around by any means, but at least the brand has covered most bases with its library. To welcome you to the Highroller family, there’s a bonus package awaiting you that’ll help you to get started in fine fashion. The kind folk at the firm will double your first deposit (minimum £10, maximum £100) with free cash, and throw a handsome 50 free spins into the bargain as well. There’s never a dull day as a Highroller player, and that’s because you’ll earn ‘coins’ seemingly around the clock. These can be exchanged in the shop for free spins, cash boosts and collectibles. And don’t forget that you can ‘level up’ too. Move through Metrocity and trouser some lucrative rewards to add to your bankroll. New customers only. 1st dep, min. £20. £1 on Dream Catcher on 1st day + 10 Spins on selected games p/day on following 5 days. Spins wagering 35x in 30 days. T&C apply. One of the very few downsides to Highroller is that at the moment it doesn't have a telephone-based customer support helpline, so unfortunately it’s a case of live chat, email or snail mail only. And it has to be said that the available payment methods are rather paltry. If you want to make a deposit to Highroller you’ll need to do so using a Visa debit or credit card, MasterCard or paysafecard, with these methods – along with a bank transfer – accepted when making a withdrawal. From a playing perspective, Highroller is an excellent site for those who want to enjoy both traditional and live casino games in a safe, fun and rewarding environment. There are a few administrative tweaks needed to bring it up to the standard of an industry leader, but rest assured you'll not be disappointed by what they offer.